We keep an eye on the discourse about cities as the world’s coming (and leading) unit of governance. We are alert to city-centricity, though. It’s so easy for celebrations of city vitality to fall back into a complacency and ignorance about the small towns that live, and often falter, between city boundaries. It also depends who’s leading the narrative on cities as engines of inclusion and democratic progress. Is it Mike Davis and Ada Colau, or is it Bloomberg and Boris? But we’re also interested in ways we can map out new forms of sovereignty and control, based on difference “We’s” (in our I - We - World framework). By which we mean we’re alert to different historic or invented localities, who might regard and map their assets and their powers in different ways. So we were happy to be alerted (by our old friend Vinay Gupta) to this really ingenious study by City Metric, the urbanism website. 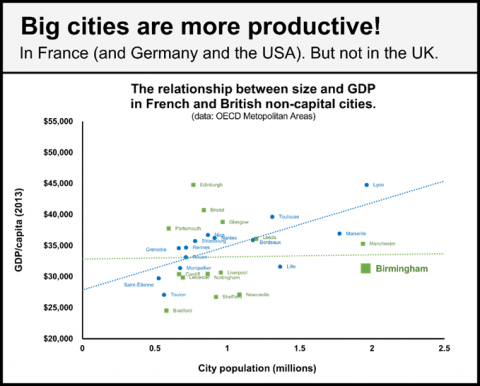 They claim to have discovered why there might be a “productivity gap” (ie, a smaller GDP gap) between UK “second cities”, and their European comparators (say, Manchester and Birmingham, and Lyon and Marseille). City Metric decided to find out the answer empirically - by examining forms of commuting at peak hours in Birmingham, in the morning and the evening. They wanted to know whether better or worse travel systems would expand or contract the working population of the city (following the agglomeration effect in European cities). To do so, they started by measuring data from Birmingham bus shelter timetables, and comparing that to cities whose trams and tube systems gave them considerably more regular and reliable public transport. They also assumed a 30 minute rule. This is an acceptable commute time from periphery to city centre, where people are travelling in for work and leisure. What they discovered - as the graphic above shows - is that because of the relative inefficiency and slowness of their bus system, the economic population of Birmingham actually shrinks at peak rush hour (breakdowns and gridlocks always being a possibility). Conversely, this implies that because effective tubes and trams aren’t in place, the true working population of Birmingham is 0.9m - those who are actually transported around, within the 30 minute rule. As compared to the 1.7m people who would be with reliable systems - the number which is close to the actual working population of the city. Closing this gap in Birmingham, predict the City Metric people, would increase GDP/per capita in Birmingham by 7 per cent. Now what’s interesting here in the City Metric study is not so much the GDP measure - we’ve critiqued that enough in these pages. Need it just be cities that benefit from digitally-monitoring systems (like the bus shelter data), that could really identify and justify improved investment or focus? Could smaller localities also do so? And what are the tools and skills the citizenry would need, to clearly make sense of these data flow of what was happening in their city, so they could act on it? City Metric have created this tool for their Birmingham data, but it’s not the easiest interface to get value from. Yet it’s good, at least, that it’s all out and open to the public sphere. And the question still lingers: is this the power of the city for the 21st century - small enough to be identifiable and mappable, big enough to trigger real changes for populations?